Cashback service Megabonus held the first game on their English social media pages ans shares how it was. SANKT-PETERBURG, SANKT-PETERBURG, RUSSIA, December 7, 2018 /EINPresswire.com/ -- First Megabonus game on English social media pages of the company has finished. The results were announced on November, the 30th on Facebook, Instagram and Twitter – the networks where the competition took place. 9 people became the winners: 3 on Twitter and 6 on Facebook. Their cash prizes (from $10 to $20) will be credited to their Megabonus accounts. It was easy to win. What you had to do was to subscribe to the page and fulfill one more action different for each network. Unfortunately, the users on Instagram were not attentive enough, so none took a chance to win. 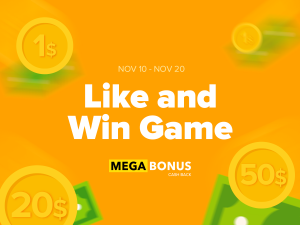 The Like and Win Game was launched on November 10, 2018, and lasted for 3 weeks giving a chance to all subscribers of Megabonus pages on social networks win from $1 to $20 or even $50. The biggest cash prizes will go to @LowngSnake on Twitter and Roman Elivanov on Facebook. The full list of the winners can be found in the article on the game’s results. The company representatives say that they will have regular promotions on their English social media pages, so subscribe (the list here) if you want to save and win. Megabonus is a cashback service that was launched in 2015 for users from Russia and the CIS only. In 2015 it was called AliBonus and returned 10% cash back on purchases from AliExpress only. On July 20, 2017, the rebranding took place and the service was renamed into Megabonus. 100 more online stores were added. At the moment, Megabonus works with 1500 online stores in 130 countries of the world and returns up to 40% of the purchase cost. The Like and Win Game was the initial promotion on English pages of the company, but not the first one Megabonus holds. There are weekly giveaways and contests on their page in VK.com, Thousands of users participate and win both cash prizes and other bonuses. Megabonus also offers a number of additional tools and solutions for online shopping and ecommerce. They make the process of buying online easier for buyers and let small companies and dropshippers earn and save more. Parcel Track. Helps to track parcels right from your browser or Megabonus app. You have to install Megabonus app or extension to take benefit of the option. Invite a Friends Program. An opportunity to earn extra cash back or start a small business driving new users to Megabonus. You get up to 50% of the cash back of the invited users. Price Change Tool. Allows to check price change and buy goods at the lowest prices. AliExpress seller reliability. Analyzes shops on AliExpress and shows a comprehensive chart of the seller’s characteristics right on the product’s page. Megabonus Review. User reviews of goods bought online. For Russian-speaking users only.